For better or worse, Mitsubishi has gone mainstream. Take the 2015 Outlander lineup, for example, where a complete overhaul for the 2014 model year leaves it softer and smoother, more elegant and more fuel efficient—altogether an appealing family automobile that can nevertheless handle a side trip through the back woods. Naturally, this compact crossover still retains its 3 rows of seating for 7 folks (though the third row is really for kids), thus offering outstanding value in its segment. Also returning for 2015 will be the ubiquitous 3 trims, the base ES, the midlevel SE and the flagship GT. Once again for the upcoming model year, lower trims will come with standard front-wheel drive (FWD), while all-wheel-drive (AWD) will be offered as an option on the SE, with the top-shelf GT again toting said AWD as standard equipment. 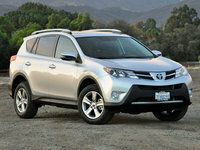 Said AWD should again include driver-selectable S-AWC (Super All Wheel Control) for various terrain challenges. Despite the next-gen improvements in 2014, a few subtle changes are slated for the 2015 Outlander, including a new upper grille design, a leather-wrapped steering wheel and shift knob that become standard in the entry-level ES, improved cabin sound insulation and some hints of minor tweaks to option packages and accessories. Of course, engine choices stand pat aboard the Outlander iterations, with the base ES and the up-featured SE both retaining the standard 166-hp 2.4-liter inline 4-cylinder (I4) powerplant of yore and the GT packing the standard 224-hp 3.0-liter V6. 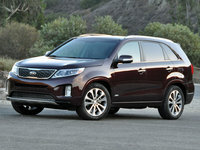 The I4 mates with the standard continuously variable transmission (CVT) for 215 lb-ft of torque, while mileage is again estimated at 25 mpg city/31 highway in FWD editions and 24/29 in the SE’s available AWD garb. The V6-toting 2015 Outlander GT, meantime, remains managed by the standard 6-speed manual transmission in putting out 215 lb-ft of torque at an EPA-estimated 20/28. Towing with a properly equipped Outlander ES or FWD SE is maxed out at 1,500 pounds, while Mitsubishi claims a 3,500-pound maximum trailer load for the peppier GT. Appearance features, depending on the trim selected, include either 16-inch steel wheels on the ES or 18-inch alloy wheels on the SE and GT variations. Inside, look for cloth or leatherette upholstery, reclining second-row seats, cruise control and telescoping tilt-wheel steering lineup-wide, with heated front seats, auto climate control, a rear-view camera and Bluetooth hands-free calling adorning upper-level trims. Oh, and cargo area remains 63.3 cubic feet with the rear seatbacks folded. Also slated to return for 2015, by the way, is the standard 140-watt audio system, boasting a single-CD player, 6 speakers and a USB port that’ll again be toted by all trims. Options-wise, look for the Outlander SE and GT to remain eligible for an available power sunroof, leather-trimmed upholstery, GPS navigation with a 7-inch touchscreen, a power liftgate and a 710-watt Rockford-Fosgate premium audio system boasting 9 speakers and Surround Sound. The base ES version, meantime, remains eligible for a number of optional goodies that come standard aboard the higher trims. Returning standard safety equipment for each Outlander iteration is slated to include 4-wheel antilock brakes (ABS), traction and stability control, 3-row head airbags, side-mounted airbags and a driver’s-side knee airbag. A remote antitheft alarm also comes standard in all Outlander variants, while the SE and GT flaunt standard turn-signal-integrated mirrors and front fog/driving lights. The GT, meanwhile, returns packing standard high-intensity-discharge (HID) headlights. Optional safety stuff for the SE and GT editions, finally, includes adaptive cruise control with forward collision mitigation and lane departure warnings. 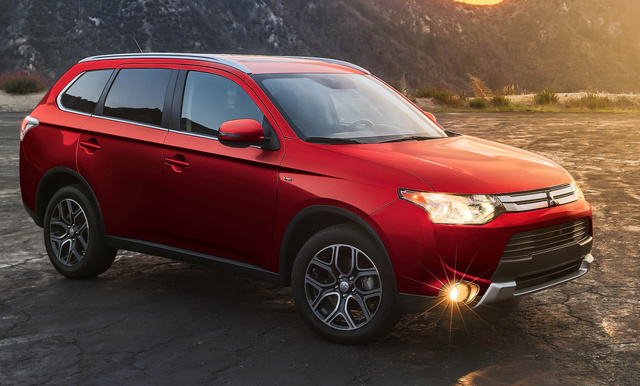 What's your take on the 2015 Mitsubishi Outlander? mittherman just got the fully loaded GT last week. So far, according to the car, it is averaging 15 mpg; which is less than the 2013 that I had. The new navi system is good, but requires a lot of studying. Car is quieter and tighter and the doors shut better and less tinny, than the 2013. 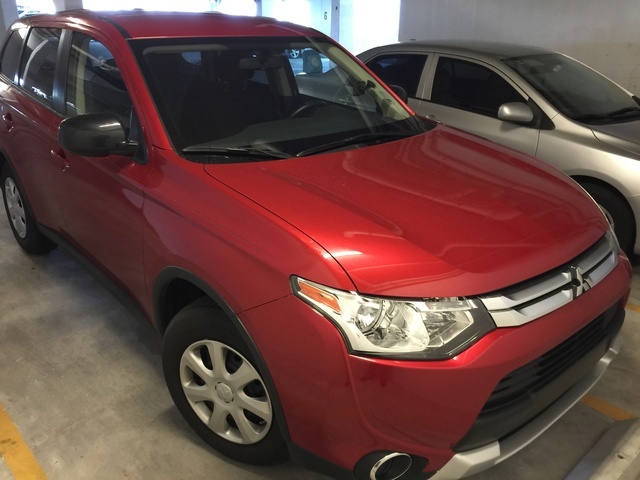 Have you driven a 2015 Mitsubishi Outlander? Smells like a dead animal when I walk up to the car. Only smelling it on the outside of the vehicle not the inside. What can be causing that?